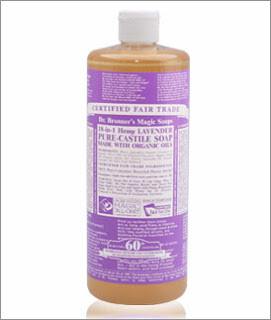 I know this is no great, secret discovery, but good god I love me some Dr Bronner's soap. Liquid please, preferably lavender, but I'm willing to try the new citrus orange. It's good for me and the environment, certified USDA organic and Fair Trade, using ingredients 100% from nature, real nature, not "technically petroleum products are natural" kind of from nature. It works spectacularly. A little goes a long way, and it suds like crazy - many natural/organic soap products don't. It also doesn't dry out the skin, which is a big problem with many body washes - and a huge problem when you live in the desert like I do. It can be used in a million different ways, apparently, although thus far I've only used it as a body wash. You can also use it as a laundry detergent, pet shampoo and all-purpose cleaner in different dilutions. I used to only be able to find this in health food stores and Whole Foods, but it is becoming much more widely available due to the popularity of organic products. I now can find it in Target and my local chain grocery store - interestingly it is cheaper at the latter.